While browsing Tate Britain for Wallinger's mess, I discovered the next major art exhibition to hit London: Hogarth 7 February to 29 April 2007. This is a must. William Hogarth was one of out most brilliant artists ever, with a huge range of works from satirical engravings to sensitive portraits in oil paint. He took the lid off English society (18th century) in a way which no artist of any period, of any country, has ever done. 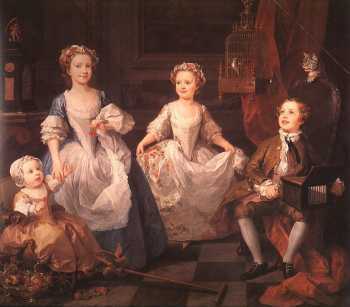 As you're probably familiar with works such as Gin Lane, A Harlot's Progress, A Rake's Progress and Marriage á la Mode, I've chosen to illustrate this blog with Hogarth in gentler mood: The Graham Children (1742). I can't promise it will be on display, but the Tate claims "This superb exhibition is the most comprehensive showing of the artist's work in living memory and incorporates the full range of Hogarth's work." Wow! No gobbledygook. Must be good. Expensive at £10 (a mean 20% discount for silver surfers: £8), but go for it. Ooh, I know! Very exciting! And his heirs Gilbert & George on at the Tate Modern at the same time, only a short walk, bus, tube or (if you feel like treating yourself) boat away. Can't wait.